I don’t know about you…but the girls at my house are obsessed with the movie Frozen. We saw it over the holidays with family and my girls have the soundtrack on repeat…all.day.long! They loved the entire show and the music…but perhaps their very most favorite part…and mine too…is Olaf. 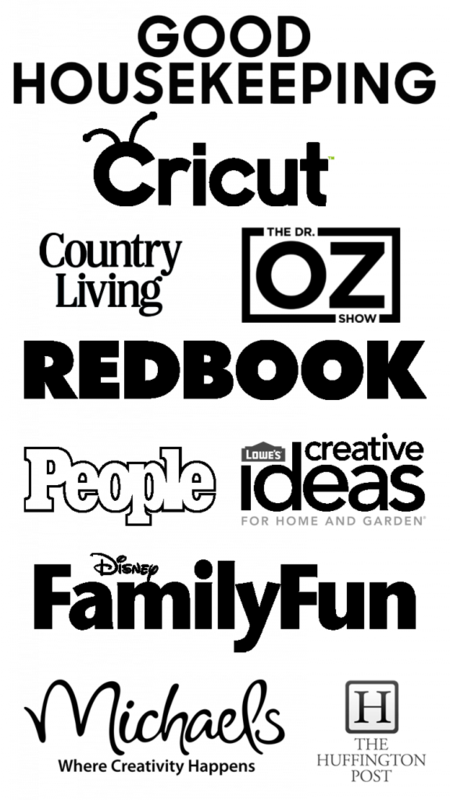 Do you have a similar obsession at your home? My girls and their friends keep on repeating their Olaf-isms. 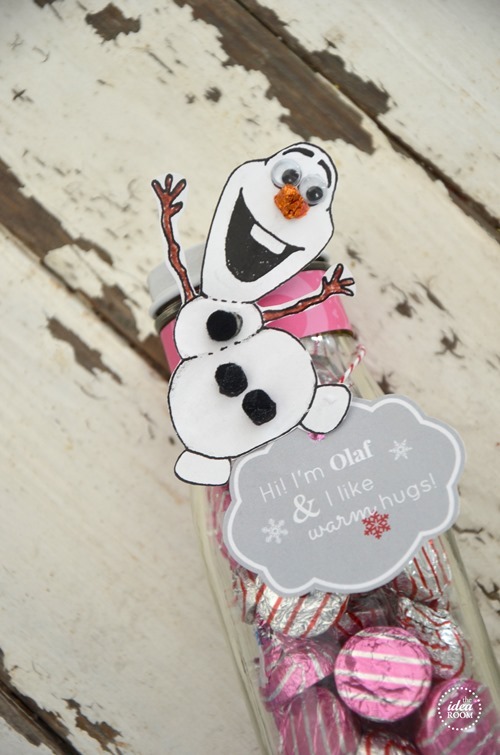 And…with Valentine’s Day right around the corner, I thought it would be fun for them to give their friends (who are equally obsessed with Olaf) some Olaf Frozen Valentine’s. 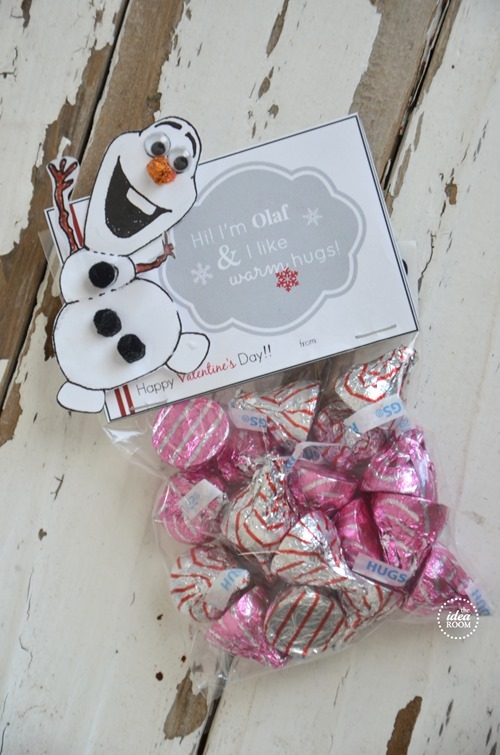 And because I love a good play on words, we came up with a couple of different Frozen Valentines with Olaf. The first one I will share is the “warm hugs”. Is it any surprise that I included a jar in one of these? haha! I know…I know. I have a jar obsession. 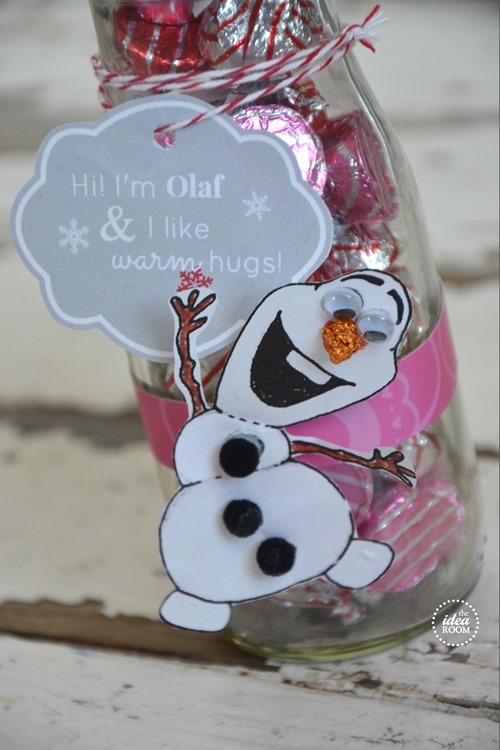 Fill up a cute jar with some Hershey’s hugs candy (the jar is a recycled Starbucks Frappuccino jar) and attach Olaf and the printable tag. If you don’t want to fill up a jar, you can use any other container or fill a candy cellophane bag and add the printable topper I will be sharing. This is probably the easier alternative and takes a lot less candy to fill if you will be using them for your kids classroom Valentine’s. 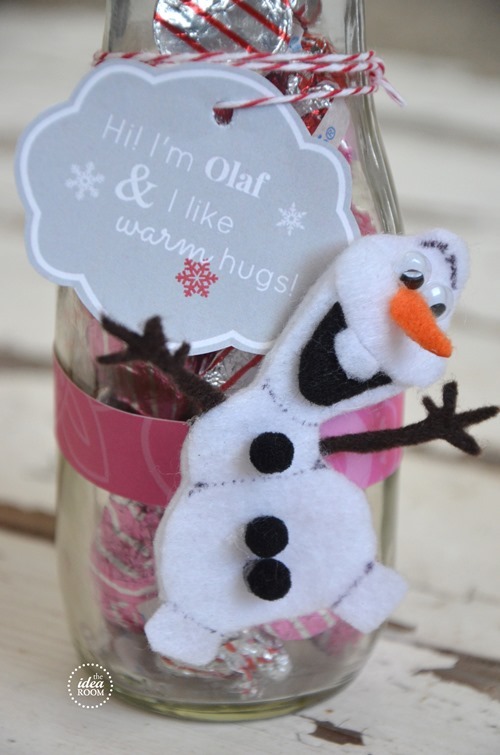 If you would like to download Olaf’s “I Like Warm Hugs” Valentines, click on the links below. 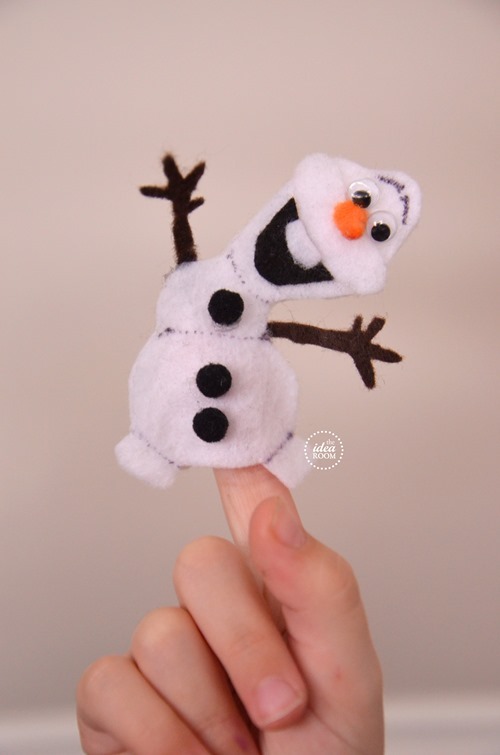 Be sure to stop back by if you are interested in an Olaf finger puppet. 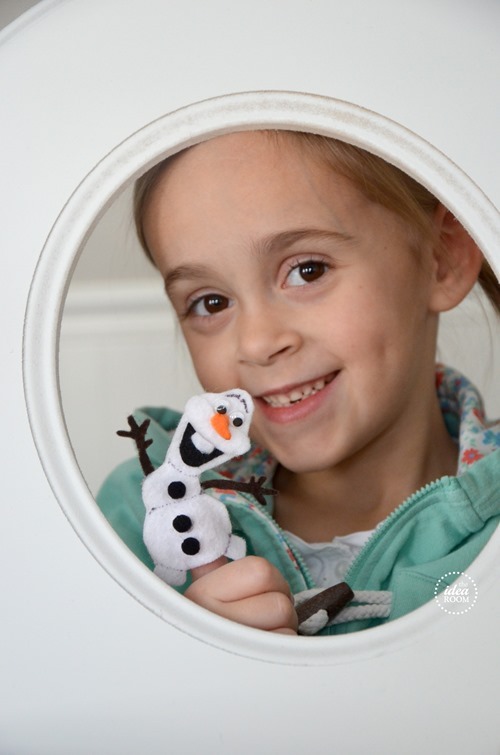 You can attach the finger puppet instead of the paper Olaf to the Valentine’s if you are feeling super crafty…or just want to make one for your Olaf obsession. Interested in other Frozen Ideas? 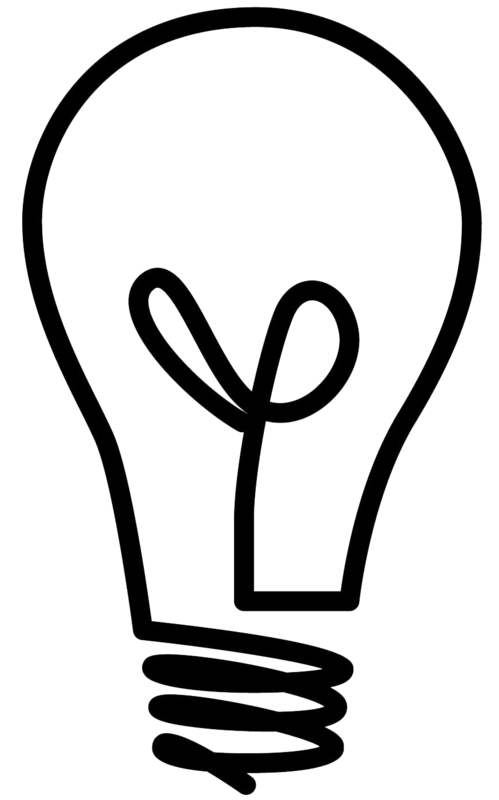 Check out these other Idea Room Posts!! I love these Valentines and my 7 year old daughter is obsessed with the movie. So thank you for creating these. But I do have a question it seems when I saved them to my computer they were a bit hazy. Are they suppose to be that way – yours in the pictures look so crisp. What am I doing wrong to not be able to get them as crisp as yours? Thank you and I am sooooo looking forward to using these…. Love it!! Over the holidays, my two teenage daughters saw the movie 4 times and bought the soundtrack. Thanks for the printables!! I really like these. Could you tell me where you get the little baggies to attach to these? I’ve seen a lot of valentines with those little baggies. Do they come in bulk at a place like Michaels or Hobby Lobby? Thanks! Yes…most craft stores sell them. I get mine usually at Hobby Lobby. The particular ones I used measured 3.75 in width. The toppers will fit that size perfectly. I was wondering if you can still download these if you don’t FB? My kids are Olaf crazy, and we just got home from meeting Elsa and Anna at Disneyland. I would love to surprise them with these for their classes!! As well as the Frozen birthday party I see looming in my near future. You really are talented, thank you for sharing!! I second that question… is it possible to download without a FB account? My girls LOOOOVE Olaf and these are TOO cute! Thanks so much for the idea! such a cute idea! love frozen! My grandkids will love this, thanks so much!! This is perfect for my first graders! We finally saw Frozen this weekend. I feared it was too girly for my 6-yr-old son, but he LOVED it. I can’t wait to show him this tomorrow. (He’s asleep now). We might be giving these away for Valentine’s Day. I was worried about my 15 and 13 year old boys being bored…but they also loved it! haha!! I love them thanks for sharing! What are you using for the nose’s? The nose is a rolled piece of orange tinfoil. Some orange scrapbook paper would work too! For the bag toppers, I can’t figure out what his nose is made from. Can you help me out? Thanks! Oh sorry. I forgot to mention that. I just used some orange tinfoil I had laying around. You could use card stock and roll it (a triangle piece). Just made these for a family sledding party. Going with the Frozen theme. And it is suppose to be -10 wind chill the day of our party in west Michigan. The kids are going to love these. They are so cute. Glad I only had to cut out 20! Really cute! Thanks! When I click on the link it takes me to Facebook. I sign in and it says the page doesn’t exist. Any thoughts? We love Olaf in our house and anything Frozen. My grandaughters, aka Elsa and Anna, are having a fit to make these for their class valentines, but I don’t do Facebook. Is there any other way to download? The kids in my classroom, mostly the girls, love Frozen and sing the songs to it almost every day. I’m planning on using the printable to make Valentine’s for my kiddos. Thanks for sharing! I am so glad you are going to be using them for your students. It seems like most kids are obsessed with Frozen this year. I know my girls and their friends are. You are so welcome! Hi there love this idea!! Thanks for sharing! Just wondering do you happen to know what size Pom poms you used? Was trying to order them online but wasn’t sure what size to get… Thanks! Thanks for sharing! These are adorable! Do you happen to know what size the poms poms you used are? I was trying to order them online and was not sure what size to order. Thanks! Unfortunately I used some that I have had laying around. They are really small and I think they are probably the smallest size but I have no idea. The size a pencil eraser. The mini size. haha. Does that help? Page says it no longer exists? Can you help? Try refreshing it. It is still there. Thank you so much for sharing! These are great! I think we’ll make them for my daughter’s preschool valentines. They’ll make great cards and a fun project for home. I am having trouble downloading these. They are so cute and my girls’ would love them. Any suggestions??? Be sure to read all the directions carefully. I apologize for it being confusing. I know it is. I just have to do it this way due to people using and selling them as their own. If you still need help let me know! The only link that comes up is the peppermint sugar scrub labels. Thank you for your help!!! YAY!! I finally figured it out!!! Thanks so much! Thank you so much for the freebies! When I printed the Olaf body to attach to the bag topper it printed too large. I there a smaller size or a way to print it smaller to fit like yours did? Sorry it I did something wrong I just pressed print but didn’t see an option for size. Thanks so much for your help! You can print at a lower percentage. It measures right now 3.75 so if you want it smaller than print it about 25% less for each inch you want it smaller. Not an exact process but it will make it smaller and proportional. Hi! LOVE THESE! However, I don’t FB. Any other way to download them without doing Facebook? Please help! I too am having trouble finding the downloadable image. Can you help me? I too am having trouble downloading the Olaf image. Can you please help? You have a lot more patience (and time) than I do! I was going to cut these out for 2 of my kids’ classes but not sure that’s gonna happen!! haha! Oh! I am not cutting them out. The girls are excited to be cutting them out themselves for their friends! I am normally a store bought Valentines kind of a mom. I did enjoy drawing and making it though!! We are making THREE (I have three girls) of your Frozen Valentines this year. Thank you so much! 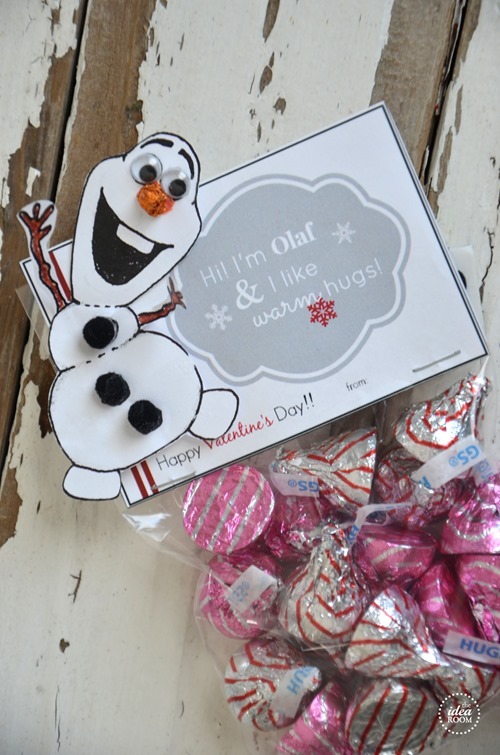 They really wanted Frozen Valentines and we found yours on Pinterest. They are ADORABLE and coming together sooo cute! Thank you!! Can you please let me know if you can download these without having FB? 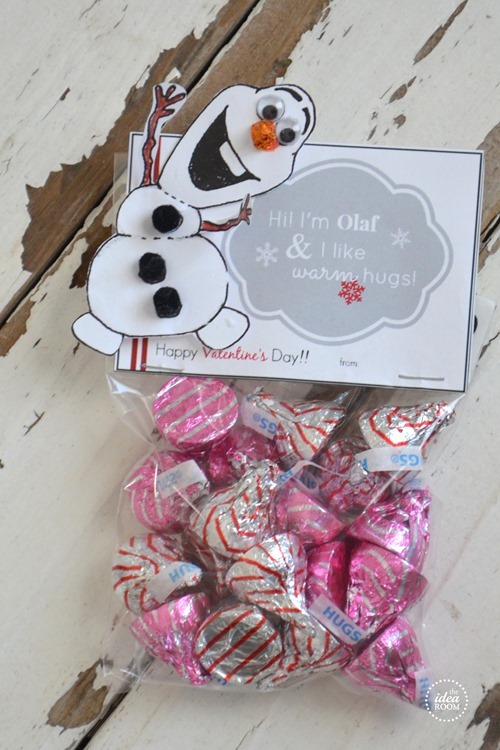 My daughter is sending Frozen Valentine’s for her class and I would love to send in this little gift bag as well. Thank you! I just wanted to thank you for the free Olaf Valentine printables. I gave you a shout-out on my blog http://weeklywanderlust.blogspot.com/. 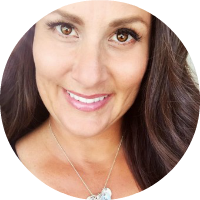 I am still new at blogging and wanted to @ you right in the blog post but couldn’t figure out how..lol! so cute ! thanks a lot ! Can you please let me know if I can download these without having a Facebook account? I love your crafts. I am unable to access Facebook at my job, but I would like to download this for my students. Is there anyway that I can do this without going through Facebook? Oh, this looks adorable. Perfect for Valentine’s Day! Under my photo on the top right hand side is a spot to enter your email address. Let me know if you can’t find it!